Advertiser.ie - Do you want a smile like Khloe Kardashian or Zac Efron? Do you want a smile like Khloe Kardashian or Zac Efron? 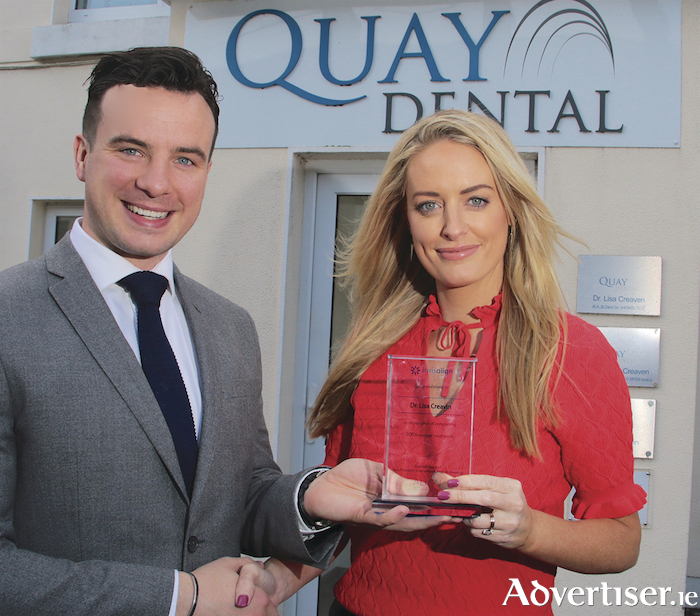 Peter Duffy area sales manager of Invisalign Clearbraces presenting Lisa Creaven with an the award for completing one thousand cases at Quay Dental, Woodquay, on Tuesday. Photo: Mike Shaughnessy. Many people are not happy with their smile. Maybe you are one of them. If you are inclined to keep your mouth closed in photographs, or cover your mouth when you laugh in company, read on. Invisalign clear braces work for minor adjustments as well as more extensive work. Their discreet nature makes them very popular with adults, but they are suitable for anyone over the age of 13. Thanks to Invisalign’s 3D technology, Clincheck©, you can see what you will look like at the end of your treatment before you start, which patients find very reassuring. As your check-ups are routinely every six to eight weeks it is perfect for the busy lifestyle most people live these days. Clearbraces.ie is a group of 10 dental practices dotted around the country. They are Ireland’s most experienced providers of Invisalign, treating more than 6,500 patients nationwide. In Galway, Quay Dental on the Headford Road is an award-winning Clearbraces.ie practice with a full-time orthodontist who is available for consultations in the evening and weekends. The state-of-the-art clinic is offering up to €850 off the fixed price list for Invisalign, and is holding free consultations on Saturdays February 24 and March 3. Call 1800 33 43 53 or visit Clearbraces.ie to book. At Quay Dental, sisters Dr Lisa Creaven and Dr Vanessa Creaven have been awarded Diamond Provider status from Invisalign, the highest status that can be awarded. There is a fixed price list, so you will know exactly how much the treatment will cost, and interest-free credit is available if it suits you to spread the payment out. So join celebs Zac Efron, Keira Knightly, Oprah, Khloe Kardashian, and closer to home model Pippa O’Connor, TV presenter Kathryn Thomas, and Andrew Browne, professional rugby player. You too can have a perfect smile without anybody knowing how.